A lifetime weightlifting and abs workout enthusiast living in eastern Washington, Marsha Wyatt is a technical editor and writer specializing in health and fitness topics including weight training and fitness and diet programs for longevity. Physical activity reduces stress by releasing endorphins, which are chemicals produced in the brain during times of pain and stress; they also improve your mood and decrease tension. Working with weights -- anaerobic exercise -- stresses and tears muscles, which increases endorphin production based on the intensity and duration of exercise. You can maximize the stress reduction from endorphins with a multi-joint weight-lifting workout and rest periods between sets. Resistance exercise using weight puts a heavy strain on the muscles, and can produce more endorphins in a faster period of time than cardio exercise. Certain strength-training exercises produce more endorphins than others, according to Luis M. Alvidrez and Len Kravitz, Ph.D., of the University of New Mexico. Multi-joint exercises that put stress on more than one joint and large amounts of muscle have been shown to produce the most endorphins during and after the workout. 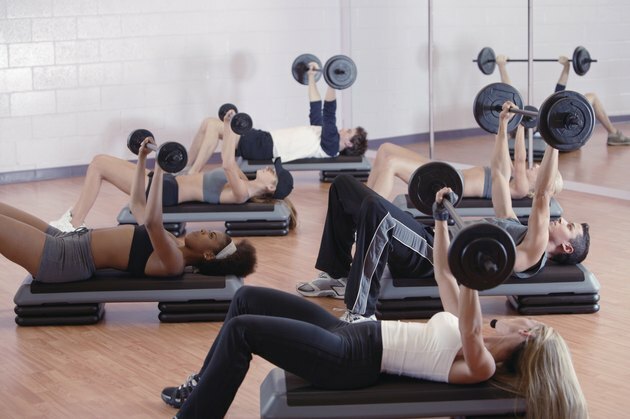 Examples of multi-joint exercises are bench press, squats and leg press. Greater amounts of testosterone and the human growth hormone are also produced with multi-joint weight-lifting exercises than with single-joint exercises. Testing by the U.S. Army Research Institute of Environmental Medicine found that a weight-training workout consisting of three moderate-weight sets of 10 repetitions with one-minute rest periods produced significantly more endorphins than heavier sets of five repetitions with three-minute rests. A greater amount of a key hormone for regenerating muscle tissue was also produced with the 10 repetition, one-minute rest period program. The exercises used in this research were bench press, double leg extension, military press, bent-leg incline sit-ups, seated rows, lat pulldown, arm curls and leg press. Is Circuit Training Good for Weight Loss?